"My husband loves quiche and he asked me if I could try to make him one. 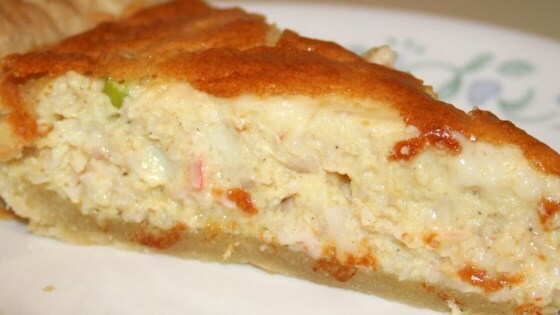 I decided to try a crab quiche, and it was gone in one sitting. You won't be disappointed!" Preheat the oven to 350 degrees F (175 degrees C). Bake the pie crust for about 10 minutes, until just starting to brown. Remove from the oven, and allow to cool. In a large bowl, whisk together the eggs, cream, salt, pepper, and hot sauce. Stir in shredded cheese, onion and imitation crab. Pour into the pie shell. Bake for 25 to 30 minutes in the preheated oven, then turn off the oven, but leave the door closed. Leave quiche in the oven for an additional 20 to 30 minutes until firm. This will give it a smoother texture. My boyfriend "politely" ate 3 bites, then pushed the plate away proclaiming he was full. Needless to say, I won't be making this again. Delicious! I have made this twice now and both times it got rave reviews! I would not deviate one bit from this recipe. It rocks!